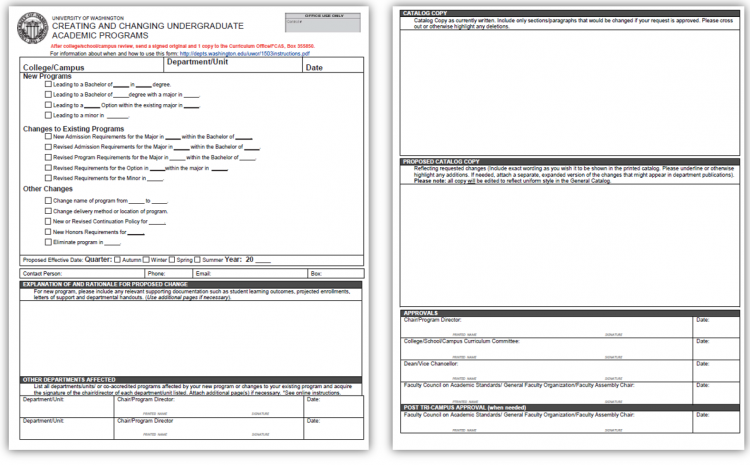 In order to create or change an undergraduate academic program, a 1503 form must be submitted. If you need to create or change a graduate program, please contact the UW Graduate School. To learn more about the undergraduate program proposal process, please refer to these FAQs. Download the 1503 form from the UWCO website. Older versions of this form will not be accepted. Provide information for the requesting department, including college and campus information. You must also include the date the form was completed. In this example, the department is revising their minor requirements. Changes to admission requirements for a BA and a BS program require two separate 1503 forms, one for the BA and one for the BS. Changes to a BA program, an option, and a minor require three separate 1503 forms, one for the BA, one for the option, and one for the minor. A new program and a suspension of admission to an existing program require two separate 1503 forms, one for the new program and one for the suspension of admission to an existing program. Changes to the admission and program requirements for a BA program. Changes to the name of and requirements for a minor. Provide the proposed effective quarter/year and all requested contact information. To determine a realistic proposed effective quarter/year, please refer to the timeline for substantive and non-substantive changes. If a program or program change is not approved prior to the beginning of the proposed effective quarter/year, it will be implemented the following quarter/year. For example, a program with a proposed effective quarter/year of autumn 2019, approved in November 2019, will not be implemented until winter 2020. Provide an explanation of and rationale for the proposed program or change to an existing program. List all departments, units, or programs affected by your new program or change to an existing program. Obtain the approval/signature of the chair/director of each department/unit listed, including their printed name and the date of their signature. Provide the copy as currently written in the general catalog. Only include sections that will change if your proposal is approved. Per the example below, cross-out and highlight any changes. Per the example below, underline and highlight changes or additions. Obtain the approvals/signatures appropriate for your campus through its approved workflow process. Ensure each signature line includes the signer’s printed name, signature, and signature date. Send the original, signed 1503 form to the UWCO.